Years Eve! Be sure to show up on Friday to have the best selection, and meet some of the brewers. And lots more. There will be taster trays available. The Festival of Dark Arts is the Carnival of Stout, the culmination of Stout Month (February). It’s a one-day, full on multi-media extravaganza based on one common theme: Dark. Well, Dark and Stout. Attendees will feast their senses on 30+ Stout beers, browse the Dark Arts Gallery, listen to a variety of live music, have their tarot read, forge iron beer openers, blow glass beer mugs, witness belly dancing, fire dancing, and even get tattoos inside the brewery. 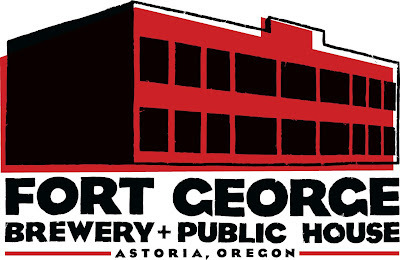 House-made, Stout-inspired cuisine will also be available for Stout soaking. This fest, now in its sophomore year is much more than a Beer Fest, it is one of the most unique parties that a brewery has ever thrown. The festival takes place on the Fort George Brewery block, throughout the Lovell Building Brewery + Taproom, Lovell Showroom and the Fort George Brewery + Public House, for the first time also utilizing the second story of the building. This date will also mark the release of Limited Edition 4 packs of Bourbon Barrel Cavatica Stout available on site for purchase. A hand-drawn map will serve as your guide, but your senses will lead the way. One day ONLY! Saturday, February 16th, 2-10pm. 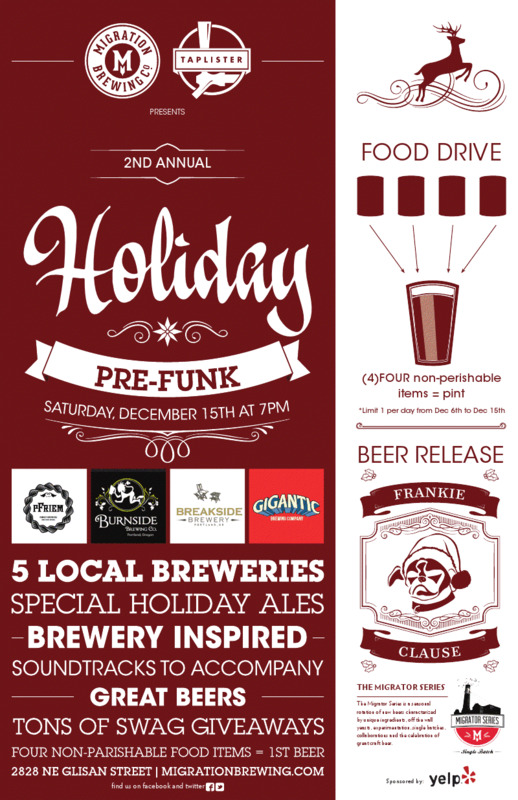 Saturday December 15th Migration Brewing and Taplister present the second annual Holiday Prefunk. 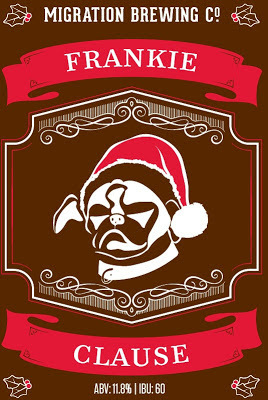 Join Migration, Pfriem, Gigantic, Breakside, and Burnside breweries who will be pouring choice holiday ale accompanied by 45 minutes of their favorite music. So before heading home for the holidays join these fantastic breweries for a night of limited release holiday ale, music and giveaways. Migrator Series Big Beer #3: Frankie Clause The third and final installment of Migration’s Big Beer series. This imperial Belgian chocolate stout rules the roost. 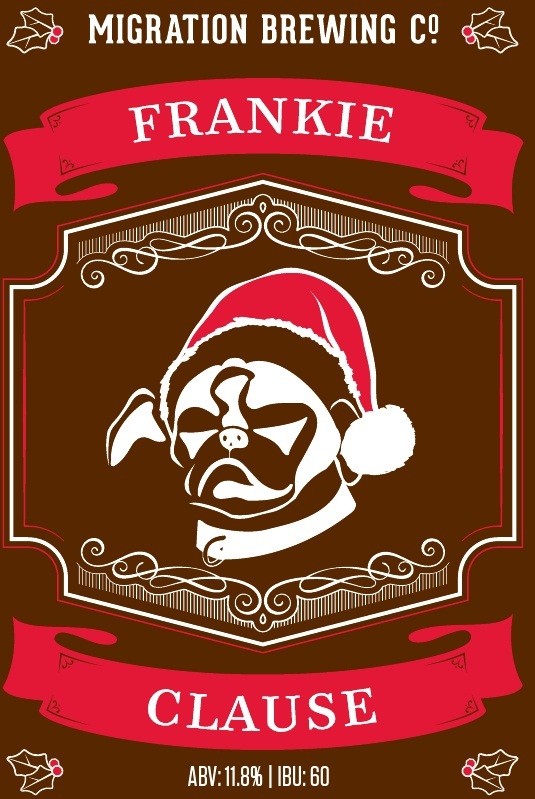 Brewed with French cocoa, Belgian Trappist yeast, and plenty of attitude Frankie Clause holds layered notes of banana, cocoa, dried red fruit, and roasted almonds. These complex flavors at 11.8% ABV this smooth stout leaves a soft warming finish. You know the holidays are in full swing as soon as the tents are up in Pioneer Square. It's also a good indicator it's time for the Holiday Ale Festival. A five day line up of some of the most amazing beers perfect for the winter season. This year I decided to attend on Wednesday. Usually a little quieter then the weekend. One of favorite things is seeing old friends, and maybe even making some new ones. Then there the beers, certainly the whole reason we are there. Of the ten or twelve beers I sampled, the real stand out for me was Cascade Diesel #2. Also kudos to The Commons for Boysen! Also as an added bonus event coordinators pulled out a few surprises. Wednesday it was a 4 year vertical of Deschutes Abyss 07-10. What a wonderful treat. If you haven't made it down the Pioneer Square I highly recommend it!